Hot weather is around the corner. Soon if not already outside get togethers and cooking on the grill will be in full swing. Ladies the grill does not completely belong to a man. I love cooking on the grill. At out house cooking on the grill is a tag team. Don't let the grill scare you. My husband and I both want to learn how to better our cooking outside on the grill. Cooking outside on the grill is not limited to cooking on meats, there is so many other things you can cook. The only way for us to learn how to cook awesome on the grill is for us to practice and find recipes that have good instruction. I want to make our meals go from mediocre to wow. Starting in June I am wanting to do a series on grilling that will hopefully post every Monday thru the summer months. 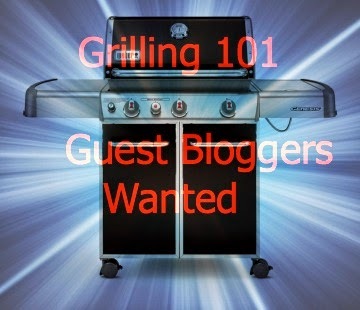 I would love to have guest bloggers who would like to share tips on grilling and grilling recipes. If you would like to share and be a guest please let me know and I will set you a date. The day your post runs you will have advertisement on all of the Nifty Thrifty Family Media Sites and your post link will be placed at the end of all posts relating to grilling during the series. If you can’t wait until June you can check out the Nifty Thrifty Family Grilling board on Pinterest to get some great recipes. You can even guest post about trying one of the recipes.